Minarik Drives' LV01-24AC-E10U variable speed drive provides exceptional performance for your fractional horsepower, low voltage DC motor (12 and 24VDC) by using filtered pulse-width-modulation (PWM). This compact, low cost drive is designed to provide 2% speed regulation throughout a 100:1 speed range. Packaged in a compact footprint, this user friendly drives will accept either an AC or DC input voltage. 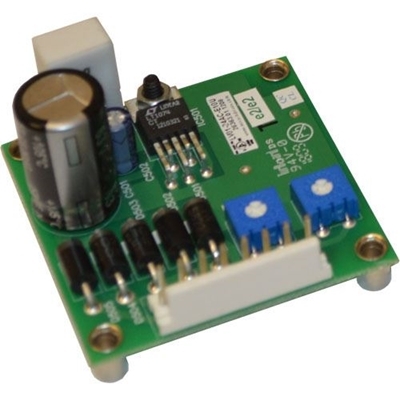 The auto ranging unipolar power supply allows standard LV drives to accept as inputs any AC voltage ranging from 8 to 24VAC or DC voltage between 10 to 36VDC. For added cost savings when the application calls for DC input only, the drives are available without the AC or DC power supply. It is available in a 2 amp output. The PWM circuitry in the LV01-24AC-E10U drive results in a 1.05 form factor over the entire speed range when an AC power input is provided. With a DC input this drive has an almost perfect DC form factor of 1.01. The LV01-24AC-E10U series is ideal for cost sensitive variable speed applications requiring outstanding performance and cooler, quieter motor operation from low voltage DC motors. * Maximum output voltage is 91% of input voltage. Low voltage motor operation: Designed for 12 and 24VDC motors. Speed range and regulation: 1% speed regulation over 100:1 speed range. User adjustable calibration pots: IR compensation, min speed, max speed and torque. Stopping modes: Decelerate to a stop by adding a N.O. switch to the pot circuit or add dynamic braking switch and resistor. Spade terminals: Easy to use, lower cost and able to fit in a smaller package. 16kHz switching frequency: A high switching frequency means a quiet motor! Additional features: AC or DC input choices and near unity form factor throughout the speed range.